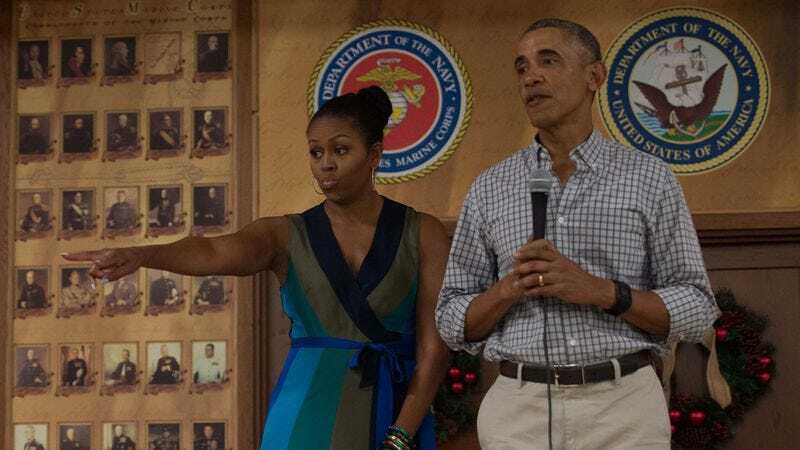 This weekend marked another milestone in the end of an era, as President Barack Obama and First Lady Michelle Obama threw a final big White House party, with a guest list featuring a number of their high-profile friends and supporters. According to Deadline, attendees as the event included Tom Hanks, Meryl Streep, Oprah Winfrey, Steven Spielberg, Dave Letterman, and a number of other big Hollywood names. Other partiers at Friday night’s bash included Jerry Seinfeld, John Legend, Paul McCartney, Lena Dunham, Samuel L. Jackson, Gloria Estefan, and, of course, White House favorite Chance The Rapper. The party—which Jimmy Kimmel poked fun at on a segment on his late-night talk show earlier this week—feels like the capstone to an administration that’s been a favorite among powerful media figures, who came together to bid farewell to the man who may be America’s last Cool President (at least, for the next four years).